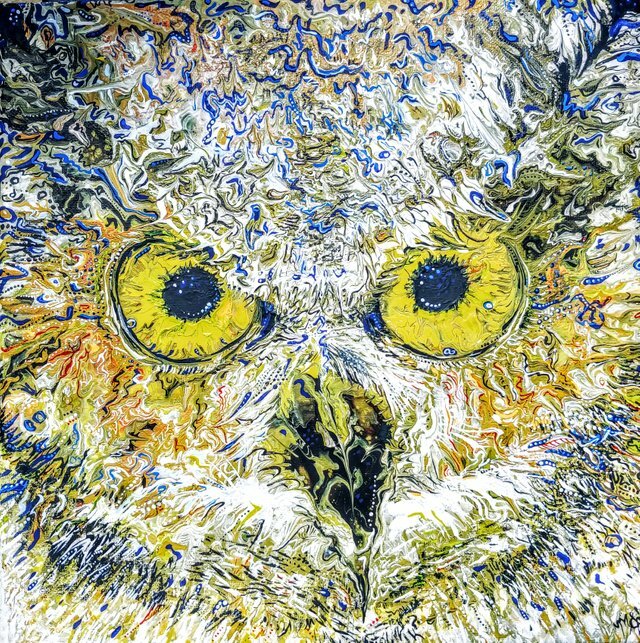 This Great Horned Owl was made by mixing cream, black, yellow oxide, raw umber with dimethicone (coconut hair serum!) (coconut hair serum!) and water intoto individual cups and then mixed together into a single cup and poured onto the 12 x 12 inch the 12 x 12 inch canvas. I proceeded to use a stick and straw to blow and pull the paint into place. Then I let it dry. I added stippling and lines to accent and added some blue and wickham grey as the person that is requesting this piece is looking to warm up a paint job that went a little too cool. This is part one of 2 pieces. I will post the second in the series next! This is also part of a bartering exchange I made with an acupuncturist. Congratulations @michelleart! You have received a personal award!